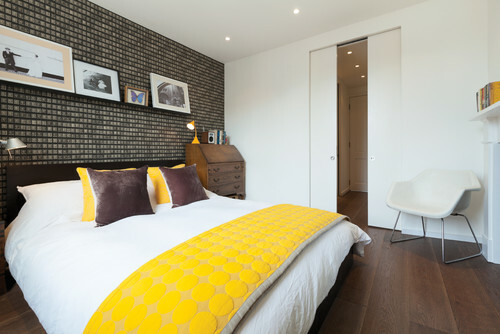 A sliding pocket door can be the unsung hero in a room scheme, freeing up valuable floor space, sliding away discretely when not in use and allowing greater connectivity between rooms when required. Here are 10 room schemes where a sliding door stole the show. 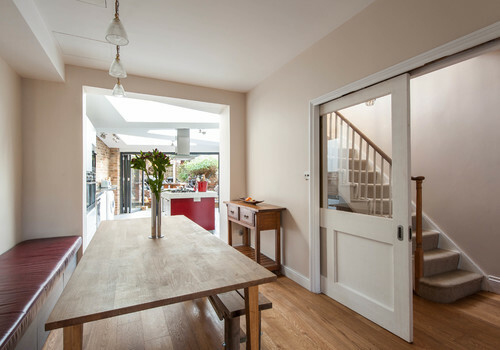 A busy hallway with lots of connecting doors and opening cupboards is a prime location for a sliding pocket door. By gliding neatly to one side to allow access to a room beyond, as shown in this hallway, a pocket door is one less thing to trip over or bump into, allowing for better circulation around a house and more floor space in a hectic entryway. With a subte shade of light grey and a simple fuss-free design, this neat sliding door subtly slots into the Scandi-style interior of this hallway. Take a leaf out of this door’s book and choose a style and colour that blends with your existing décor to ensure it looks right at home. This open-plan living room and kitchen space has been created from the framework of two separate rooms, and the inclusion of tall pocket doors between the the two areas allows for the space to be returned to its original layout in an instant, with the doors filling in the area where a dividing wall would have been. 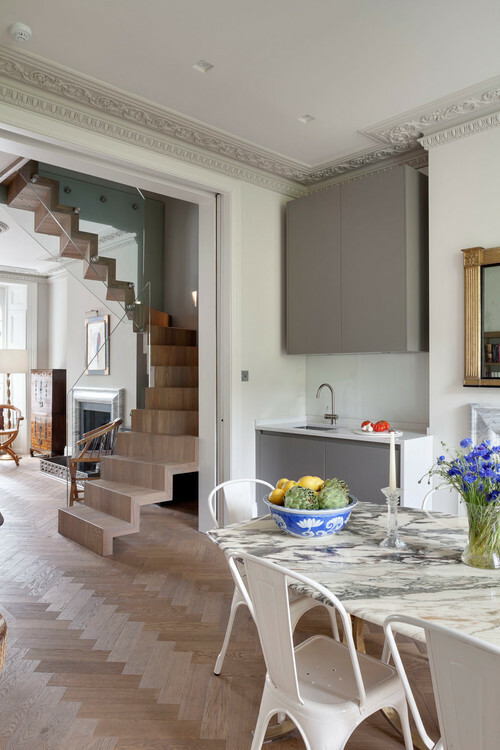 By taking the doorframe right to the ceiling and as far out to the edges of the room as possible (doubling up the pocket doors to allow for this), the room is almost completely open-plan when the doors are pulled back. Because of the ‘now you see it, now you don’t’ element to pocket doors, they can be a really fun way to play with colour in an interior, changing the feel of a room from practical to playful in an instant. The bold turquoise door in this open-plan kitchen-diner shows how a sliding pocket door can add something special to the interior of a space. If you’re considering something similar, keep in mind that the colour needs to work well when viewed from either side, so it will need to complement the décor of the room beyond. 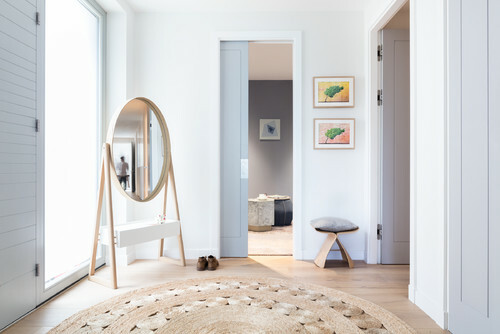 If you want to minimise the impact of a connecting door, or ‘hide’ a wardrobe or bathroom beyond, then a set of plain pocket doors like these, designed to slot discreetly into a contemporary room scheme, is a neat solution. Choosing flat-panel doors with recessed handles, and taking them right up to the ceiling, will create a super seamless finish when the doors are pulled right across. A grand doorway like this one would traditionally have had panelled shutters or large doors to divide the two rooms, but a pair of panelled pocket doors provides the same level of period authenticity while also bringing in a modern level of practicality to the space. 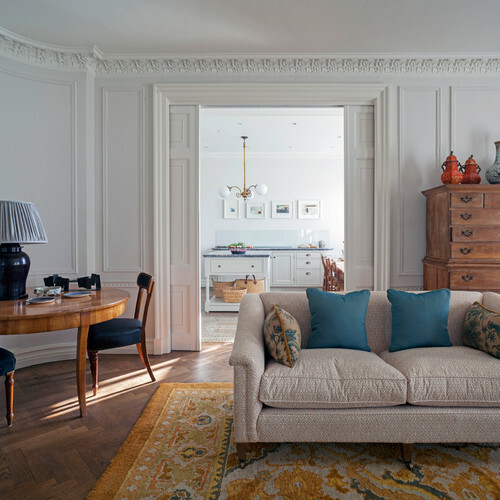 If you want to bring a traditional feel to your interior, consider a set of panelled pocket doors like these, but look to the period of your property for clues as to the style of panelling that would be most appropriate for your home. Now this is a room design that shows how to squeeze every last drop of potential out of a compact floor plan. The double pocket doors tuck right back into the wall to allow full access to the living room from the hallway beyond without impacting on the floor space. 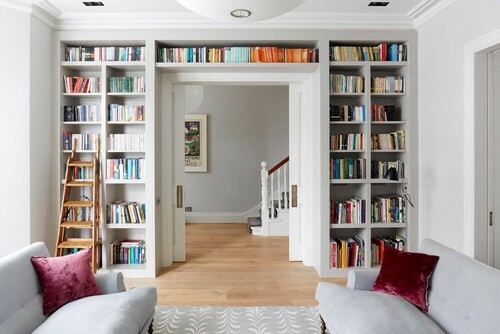 The tuck-away doors also clear the way for bespoke shelving up and over the doorframe. A half-glazed sliding door like this one is a good solution if you’re not sure if you want a doorway or an open-plan layout. This door can be pulled shut to keep the heat in or to provide privacy from the rest of the house when required, but the glazed panel still allows a visual connection, as well as ensuring the dining space remains bright and airy. This is a smart option for a room that connects with a hallway, as each space can borrow light from the other and privacy in a hallway is rarely required. A pocket door is a good solution for enabling a better connection between two separate spaces. A bathroom and a dressing area, for example, will need to be divided with a door when the bathroom is in use, but will also need to be connected at other times, for example when getting ready for work in the morning. In this instance, the entire wall space outside the bathroom in the hallway has been utilised for storage, with a dressing gown hook outside the bathroom that is still accessible from the bathroom, thanks to the fully retractable nature of the pocket door.